Among the notable shareholding changes that took place from Feb 6 to 12 was the emergence of Ang Li-Hann as a substantial shareholder in Instacom Group Bhd (fundamental: 0.85; valuation: 1.20) with a 20.17% stake or 204.1 million shares on Jan 23. According to a filing from the computer software developer dated Feb 10, Ang’s holdings rose following Instacom’s acquisition of 1.4 million shares or 35% equity interest in Neata Aluminium (M) Sdn Bhd for RM58.8 million through the issuance of new Instacom shares at 19 sen apiece. Ang is Neata’s largest shareholder. The transaction was pursuant to a deal sealed in October last year in which Instacom would issue 309.47 million new shares at 19 sen each to Ang and his partners in Neata, namely Ooi Eng Kean, Nor Amin Shaharudin and Chia Kok Seng. Over at Dialog Group Bhd (fundamental: 2.10; valuation: 0.70), filings show a private placement of 85.6 million shares or 1.7% equity interest in the company at RM1.56 apiece by executive chairman and major shareholder Tan Sri Dr Ngau Boon Keat plus parties aligned to him. According to a Feb 12 statement, Ngau and parties connected to him intend to utilise net proceeds from the placement to convert their current holdings of up to 108.32 million warrants in Dialog into ordinary shares. Shares arising from the warrant conversion will represent 2.1% of Dialog’s enlarged share base, and Ngau and parties aligned to him will have 1.18 billion shares or a 23.3% stake. The exercise will increase Dialog’s working capital, which can be used to finance its commitments in the Pengerang Terminal Phase 2 project and Pengerang Liquefied Natural Gas project while maintaining a healthy gearing ratio, which stood at 0.19 times as at Dec 31, 2014. Meanwhile, filings show ETI Tech Corp Bhd (fundamental: 0.15; valuation: 0.30) no longer counts Tan Sri Quek Leng Chan and companies related to him as a substantial shareholder as at Jan 30. This was after HLB Nominees (Tempatan) Sdn Bhd sold 50 million shares at undisclosed prices. According to earlier filings, Hong Leong Bank Bhd emerged as a substantial shareholder of the company, which conducts R&D of battery management systems, with a 9.51% stake as part of a debt settlement scheme. 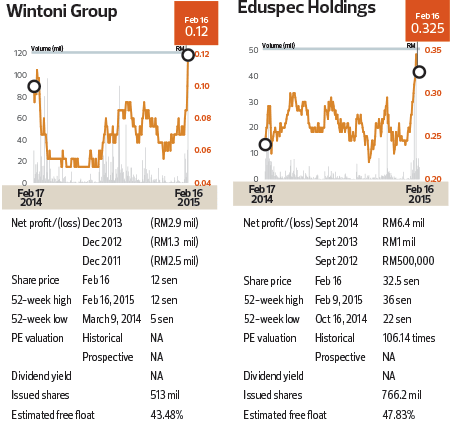 Closing at 12 sen last Monday, shares of Wintoni Group Bhd (fundamental: 1.95; valuation: 0.30) have doubled from the 6 sen apiece it closed at on Jan 5 this year. On Feb 10, the information technology business solutions provider, formerly known as Winsun Technologies Bhd, saw 24.8 million shares or a 4.83% stake crossed off market in a single direct deal at 8 sen apiece or RM1.98 million in total. The shares changed hands at a 5.8% discount to the 8.5 sen apiece they fetched on the open market. The buyer is likely Yap Kok Weng — filings show he bought 24.8 million shares on Feb 10, one day after he bought 12.8 million shares and emerged as a substantial shareholder with 37.3 million shares or 7.27% equity interest. He had a 12.11% stake as at Feb 10. Also seeing a good run were shares of e-learning service provider Eduspec Holdings Bhd (fundamental: 3; valuation: 1.2). Closing at 34.5 sen on Feb 9, the stock climbed 43.75% in less than a month from its recent low of 24 sen on Jan 13. The stock has since given up some of those gains, closing at 32.5 sen on Feb 16. Amid its recent stock gains, Taiwanese investor Chung Chih-Chieh ceased to be a substantial shareholder of Eduspec on Jan 30 after selling 20 million shares or a 2.61% stake on the open market. Before the disposal, Chung had acquired five million shares or a 0.65% stake on Jan 9, bringing his total holdings to 7.52% or 57.64 million shares. This article first appeared in The Edge Malaysia Weekly, on February 23 - March 1, 2015.